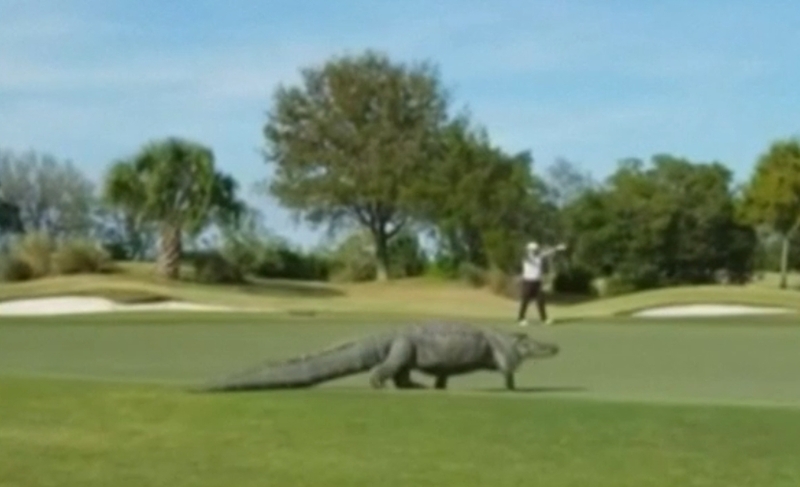 I bet the ladies playing on Saturday in the Roger Burman Warm Up Trophy and who commented on the great conditions, didn't have to face this monster as it strolled across the green on a course in Georgia, USA last week!! Whatever the hazards at Chesfield Downs, they are nothing compared to watching an alligator walking just feet from you!! On home ground, Chesfield's penalty areas obviously didn't deter Jackie R, who won the competition with a great score of 41pts (6 pars and 1 birdie) beating Megan B by just one point! Brilliant result girls!!! Earlier in the week, Thursday ladies competed for the Maria Moore Millenium Bowl, which this year was played as a Pairs Betterball competition. The weather was once again kind. Taking top spot were Jackie S and Hazel B with 42 pt. - a great score ladies. Unfortunately for them, Jackie was unable to win the Bowl, due to the lack of qualifiers under her belt, so the winners of the Bowl this time around were Katy Cook and Lin Goodey with just one point less (41 pts). Well done to the winners and all those taking part. Tuesday of last week saw some last minute to'ing and fro'ing of numbers for various reasons and so the planned format was changed to a Pairs Betterball. Coming in 2nd place were Olive C and Jan K but winners on the day were Anne L and Katy with 44 points between them. Well done to them and all the Tuesday ladies who played. So with the results all covered, lets move to a few reminders. I think most of the ladies playing in the Captains Drive In have selected their food option, but if you haven't, can I remind you to do so, please. As you will have observed, the grounds staff have been busy over the last months positioning large boulders into the red penalty areas to ensure the integrity of the ditch is maintained. However, some people are still crossing the ditch particularly on the 14th on foot and with their trolleys, can I please ask that you use the bridges at all times, thank you. On Saturday 13th April from 12 noon to 4 pm, Chesfield Downs are hosting a Crown Oneshot event which will be like an Open Day with a 40ft Putting Competition, fun activities, a BBQ and lots more. If you are free, please do come along and join in the fun! There is a sign-up sheet in the locker room for all those ladies who play 9 holes or maybe just like to come up for a chat and a cuppa, to join us for afternoon tea on Jubilee Jug day, Thursday 11th April at 3 pm. We love having you with us, so please see if you can come along and join the fun of seeing the costumes!!! Jackie R is kindly organising a trip down to the Royal Albert Hall on Wednesday 6th November to see 'The Music of the Night'. If you are interested please take a look at the poster in the locker room and speak to Jackie before 8th April deadline. Finally, as many of you have been aware, it has been a difficult time for me over the last few weeks. Can I say a huge thank you for all your support and kind words of comfort. Dad had a very long, happy and well-lived life and we, as a family, will take great comfort in that!